It’s exactly a year since Adidas launched ‘Impossible Field’, a soccer TV advert featuring English football striker David Beckham and other Adidas stars, playing football on a field of steel girders. They play against the odds of height and darkness, demonstrating the balanced properties of the new Adidas Predator soccer boots. It becomes clear that the girders are in fact the raised lines of a football field. One by one the players in red are knocked off the girders by the superior ball skills and athletic capacity of the Adidas team. Finally the ball is kicked into the goal with such force that the goalie is knocked back into the net. The whole goal falls back into the nothingness. The tagline: “Impossible is Nothing”. Adidas ‘Impossible Field’ was created at advertising agency 180 Amsterdam by executive creative director Andy Fackrell, creative director/art director Dean Maryon, copywriter Ben Abramowitz, executive producer Peter Cline, senior agency producer Tony Stearns. The creative team drew inspiration from martial arts movies Crouching Tiger and Kill Bill. Filming was shot by director Daniel Kleinman at Kleinman Productions, London, (now Rattling Stick) and Twenty-four Seven, Madrid, with producer Johnny Frankel and director of photography John Lynch. Filming was done over several days in a Madrid studio, with all the surfaces painted in blue. The soccer players were originally filmed doing their stunts on wooden rails on the floor. Editor was Steve Gandolfi at Cut + Run, London, along with producer Charlie Caselton. Post production for Adidas Impossible Field was done at Framestore, by VFX supervisor William Bartlett, senior inferno artists Avtar Bains and Stepane Allender, Roto artists Nichia Kumkeaw and Daria Ashley, CGI artists Simon Stoney, Dean Robinson and Laura Dias. 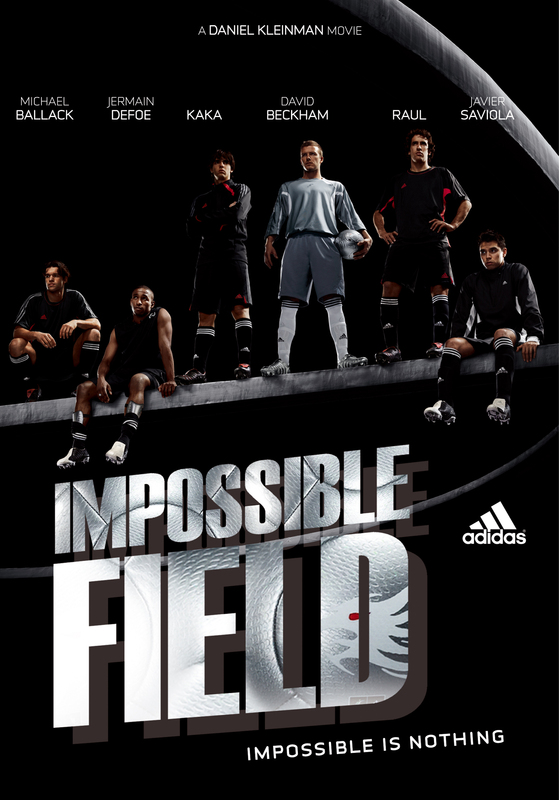 The suspenseful music for Adidas Impossible Field was composed by Junkie XL (Tom Holkenborg). Sound was mixed by Raja Sehgal at Grand Central Studios, London. Sound was designed by Dane Davis and Eddie Kim at 740 Sound Design, Los Angeles.